Each week, the Content industry observes a sacred ritual: Together, but not quite in sync, dozens of websites embed and then post the longest segment from John Oliver’s HBO show, Last Week Tonight. That John Oliver’s weekly video(s) will go viral is, at this time, a given. Whether or not the posts that embed those videos will go viral is another matter altogether. Each time around there are winners, losers, and mere participants. Two weeks ago, we congratulated Upworthy, The Huffington Post and overall winner Time, which harvested 21,598 Facebook interactions from John Oliver’s video about sugar. Last week’s contest was won by Slate, with 16,866 interactions, but Time’s gamble on a second, less newsy John Oliver segment paid off, netting the publication 10,946 interactions. This week’s anchor segment is about the lottery. Here are the results. This data was collected on Thursday evening, November 13th. The video and its many instantiations are still not done collecting traffic, but the rankings are now unlikely to change in any meaningful way. At the time of measurement, this video had produced at least 66,916 Facebook interactions. 15,407 of those interactions were claimed by links to the YouTube video itself. 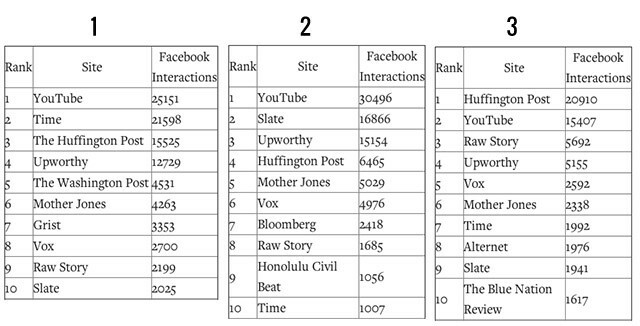 This left 51,509 surplus Facebook interactions to be claimed by a pool of 73 sites. If these shares were rationed equally, that would work out to about 706 free shares apiece. But that is not the world we live in! So congratulations are in order to our top three video posters, as determined by Facebook, as measured by SharedCount: Upworthy, The Raw Story, and, in first place, the Huffington Post, which harvested 20,910 Facebook interactions. Last week’s episode was the season finale, and this will be the last John Oliver Video Sweepstakes post. It’s appealing, now, to try to draw conclusions from our limited data. Perhaps the content-sharing public is developing a sort of herd immunity to embedded John Oliver videos, resisting all but the most virulent specimens; this would help explain why there were more embeds than ever, but a relatively small number of shares. 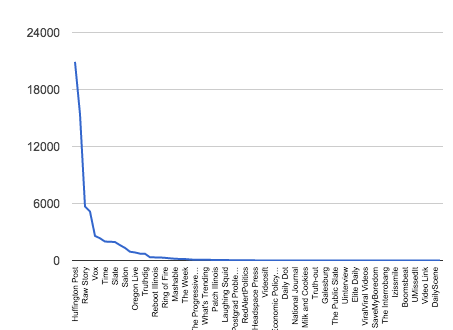 Thirty-five sites managed to collect ten shares or fewer. Thirteen collected zero, and I’m certain I didn’t find all of them. Or is the internet itself developing some sort of immune response? This week, the task of finding the embeds was more difficult–for reasons unknown, many sites that previously showed up in Google News searches were not present. Should we take the consistent success of a handful of sites to mean that social media “management” is more like search engine optimization than its practitioners would have us think? Or do we see the continued presence of weird anomalies as evidence to the contrary? And what do we conclude from the Huffington Post’s embed of John Oliver’s video gathering more shares than the YouTube video itself? That embedding is somehow getting more powerful? No, we can conclude none of these things. Such are the temptations of data journalism. 3. John Oliver Just Started ‘Show Us Your Peanuts’ To Call Out A Massively Shady Industry. Sign Me Up! 1. Don’t Care About Your State Legislature? Let John Oliver Amusingly Explain Why You Should. It will be sad to watch this strange and diverse fraternity of sites, brought together only by their desire to embed John Oliver videos, dissolve. But who knows? Maybe one day they will find themselves united again, by video or by meme, by gaffe or by death, in the spirit of sharing.